Michael Haim was convicted Friday, April 12, in a Jacksonville courtroom of second-degree murder for the 1993 murder of his wife Bonnie. (CNN) - Michael Haim, who took the stand to deny killing his wife and burying her body in their backyard in 1993, was found guilty by a Florida jury Friday of second-degree murder. The jury of three men and three women deliberated about 90 minutes before their verdict in the high-profile cold case was announced. Haim showed no expression as the verdict was read. Haim's son, Aaron Fraser, was among the relatives of Haim's then-wife, Bonnie, sitting on the prosecution side of the court. Some wiped tears. As a boy, Fraser would play with a toy dump truck in his backyard in Jacksonville, Florida. As a man, excavating behind his childhood home in 2014 as part of a renovation, he wielded a shovel -- and discovered the yard was a clandestine grave. Fraser would find the skull and bones of his mother, who had gone missing in January 1993. "On that day, that mother and child reunion brought Aaron Fraser face to face with the product of this defendant's ill will," prosecutor Mac Heavener told a state jury Friday, referring to Haim. "It brought him face to face with the product of this defendant's hatred," the prosecutor said. "And it brought him face to face with the product of this defendant's spite and evil intent." 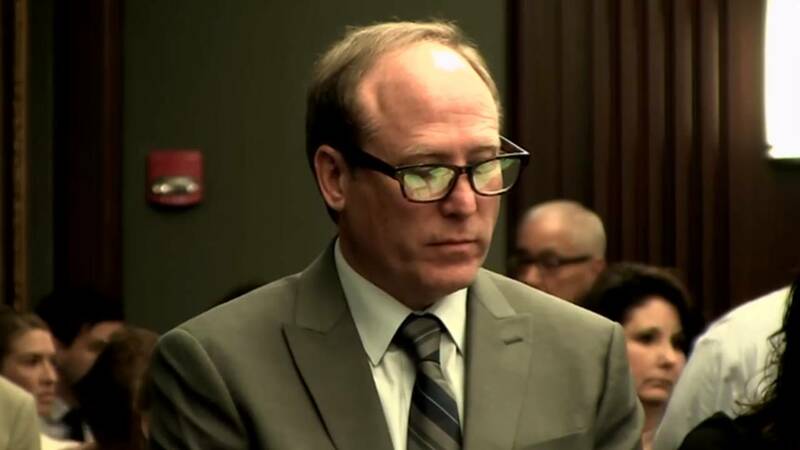 Wearing glasses and an olive-colored suit, Michael Haim, 53, stared straight ahead and displayed no emotion --not then, nor any other time Heavener pointed at him during closing arguments. The defendant took the stand this week and maintained his innocence, as he has since his wife disappeared. "I loved my wife," he testified Thursday, according to CNN affiliate WJXT. "I would never hurt my wife." But Heavener described Michael Haim as a man going through marital problems and -- again pointing at the defendant -- a "guy who's really good, really accomplished at burying the truth." After reaching the verdict, Judge Steven Whittington began the penalty phase of the case. The same jurors heard testimony from witnesses about aggravating factors that could get Haim a longer sentence: whether the crime was committed in presence of a family member, included tampering with evidence, was committed in a heinous, atrocious and cruel manner, and inflicted severe emotional trauma on the victim's family. The jury agreed on three of the aggravating factors but found the crime was not committed in a heinous, atrocious and cruel manner. Fraser testified that he has been in therapy since childhood. He described a "very uneasy" encounter in which his paternal grandparents told him that they loved him but that he had been "brainwashed." He also spoke about finding his mother's skull in the yard of his childhood home. "It was very tough," he said. "I think everybody can imagine, even if it's not a loved one, finding a skull and picking it up and what that would do to somebody. Not to mention, that it was your mother." Sentencing is set for May 17. On January 7, 1993, Bonnie Haim did not show up to work. Michael Haim would later say the couple fought the prior night and that she left the house alone around 11 p.m.
Heavener told jurors the defendant had the motive, the opportunity and the ability to kill his wife. He knew Bonnie Haim planned to leave him and take their son, then 3 years old. The night before she disappeared, she called her best friend. She was crying and upset. She told her friend that she would speak with her in the morning. Referring to Michael Haim as "Mr. Ill Will. Mr. Spite. Mr. Evil Intent," the prosecutor said the defendant owned the type of firearm used to kill Bonnie Haim and that a sandy footprint on the floor mat of her car matched his size 10 Nike sneakers. "You'll see the truth scream from those floor mats," Heavener said. "The shoe print speaks volumes in this case. ... He had just finished digging that grave." Bonnie Haim's purse was later found behind a Red Roof Inn near Jacksonville International Airport, where police later discovered her car in an airport parking lot. Heavener said a lone key to Bonnie's car was in her purse. Another car key, along with her house key, was at the couple's home. "It's pretty odd to think that a woman is going to leave her son, abandon her job and leave her house (without) a set of keys she normally uses, leaving all her earthly belongings inside," the prosecutor said. Beyond his client's claim of innocence, Michael Haim's defense attorney told jurors the state's case was built on "innuendo" and "hypotheticals that don't exist." "Michael Haim is not guilty, not because I say he's not, but because that's what the law is in this case," Tom Fallis said. "You will find a lot of reasonable doubt in this case." Prosecutors were stretching the truth to secure a conviction, Fallis said. "They're going to stretch a lot because they don't have the evidence they need to prove beyond reasonable doubt," he said. "They'll take anything and stretch it to get that conviction because that's what they do. That's what their job is." In rebuttal, Assistant State Attorney Alan Mizrahi told jurors: "The truth about this case demands justice. Bonnie Haim cannot get justice. It's up to us, the living, to find justice for her." Michael Haim took the stand Thursday, attesting to his love for Bonnie Haim. He also testified to his wife's state of mind on their last night together in January 1993. "She'd been unhappy for, maybe, a month, maybe two," he said. "I can't put my finger on how long, but it had been going on where she wasn't her bubbly self like she was." A prosecutor asked Michael Haim why he went to bed the night his wife walked out, tucking in next to his preschooler. "I assumed she was going to her mother's," he said. "I don't really know what else to tell you." Defense attorney Janis Warren said during opening statements that prosecutors did not have enough evidence to prove Michael Haim's guilt beyond a reasonable doubt. But two inmates on Wednesday testified that Michael Haim in 2015 confessed to killing his wife while he was in jail with them, WJXT reported. "He started talking about, you know, how he killed his wife: how he choked her, how her son was mad at him. He buried her in the yard," Terrance Richardson said. The discovery of Bonnie Haim's body a year earlier had led officials to arrest Michael Haim and charge him with second-degree murder, prosecutors have said. "The truth was always out there, buried in their backyard," prosecutor Mizrahi said Tuesday during opening statements. The childhood memories of Fraser, who reportedly assumed his last name when he was adopted, also became a major part of the case. Shortly after his mother vanished, he told a child welfare worker, "Daddy hurt Mommy," WJXT reported. "Aaron also stated that, 'Daddy shot Mommy,' and, 'My daddy could not wake her up,'" a 2015 arrest affidavit said, according to WJXT. Bonnie Haim's remains were found under a shower pallet in the home's backyard, according to testimony. A .22-caliber shell was also found near the body, and Michael Haim owned a .22-caliber rifle. Although a medical examiner could not affirmatively determine how she was killed, Mizrahi argued that Michael Haim shot her in 1993, then buried her. Investigators had searched the property several times in the years after her disappearance but did not find her remains until Fraser's discovery two decades later. But Warren, the defense attorney, reiterated to jurors that prosecutors would not be able to prove that Michael Haim killed her and placed her body there on the night she disappeared. "The only thing that's important is: Can they prove he killed her? And can they prove he put the body in the yard?" she said. "There's no evidence of either one of those."